I’m so glad it’s finally here. Today’s Friday Five Link-up topic (hosted by Courtney of Eat Pray Run DC, Mar of Mar on the Run, and Cynthia of You Signed Up For What?) is A Day in the Life. This topic is actually the perfect post for me, because my routine has changed dramatically this week. 1. Alarm goes off at 5:34. I added the little emojis hoping to trick my brain into being excited about being awake so early, but so far it’s not working too well. 3. It’s time to battle through the rush-hour traffic of the subway system. This part is definitely the most stressful, although I’m getting pretty good at navigating the Boston subways, which I never had to do before. 4. I finally make it to my building (assuming all goes well on the subway and train). The building is really beautiful, and it’s exciting to work in such a cool environment. It also has an Au Bon Pain so I can finally get more coffee and satisfy my caffeine cravings. Have a great weekend! Seriously – does anyone have tips on blogging when you have a crazy-full schedule? This entry was posted in Life and tagged A Day in the Life, Boston, Friday 5 Link-Up. Bookmark the permalink. Congrats on the internship – looking forward to hearing more! I don’t have any great blogging tips for when you’re crazy busy (which I have been lately) but if you hear of any, please send them my way! 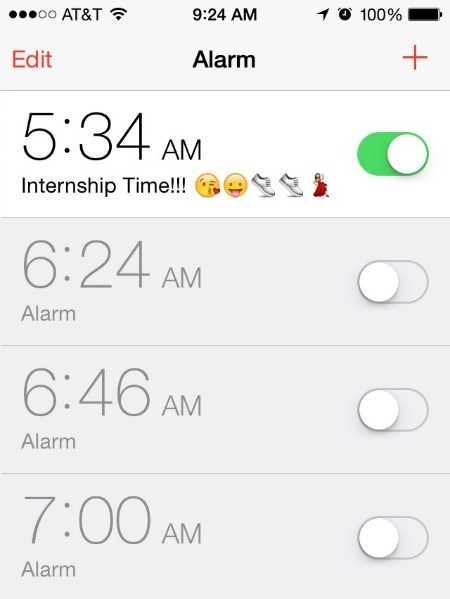 Love your alarm clock, so cute! As much as I hate driving and being stuck in traffic, I am sure the subway can be just as bad at times. Good thing I fly everywhere:) have a great wkend! hahaha to answer your question about finding the time, check my latest post 🙂 thanks for linking up w/us nora! !